Sometimes first impressions aren’t exactly correct. After one brunch a few years back I had Oasis Cafe pegged as a mostly vegetarian restaurant. Nothing is wrong with that except for it&apos;s just incorrect. Oasis Cafe has slowly transformed into a meat-loving place to gather, still maintaining excellent vegetarian and fish selections and a kitchen divided. And they are not just a good spot for brunch, as they have amazing salads at lunch time and a dinner menu with so many tasty entrees its seriously hard to choose. So as it turns out, Oasis Cafe is much more than I’d hoped. We started with the Wild Mushroom and Sausage Canape and continues a meat loving dinner from there. 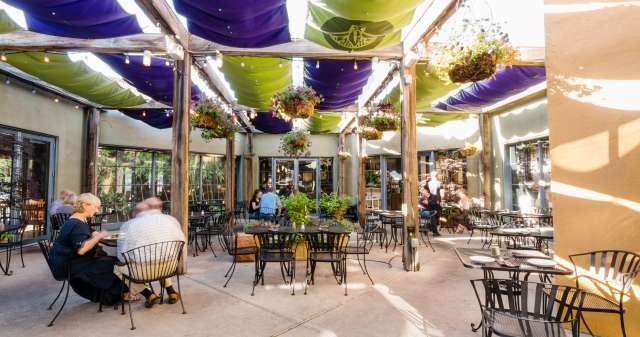 So if you’re like us and had a preconceived idea of Oasis Cafe, now you know that they offer more than fish and vegetarian options, plus they have an amazing heated patio and are located right next to a quaint book store which you can roam around before or after a meal. For more info on Oasis Cafe including photos and descriptions of what we ate, visit theSLCfoodie.com. Read more from Becky Rosenthal at www.slcfoodie.com.